Well, I have been working hard to make the most of my vacation. It just started! I taught a college for kids class last week, so I am finally on break. 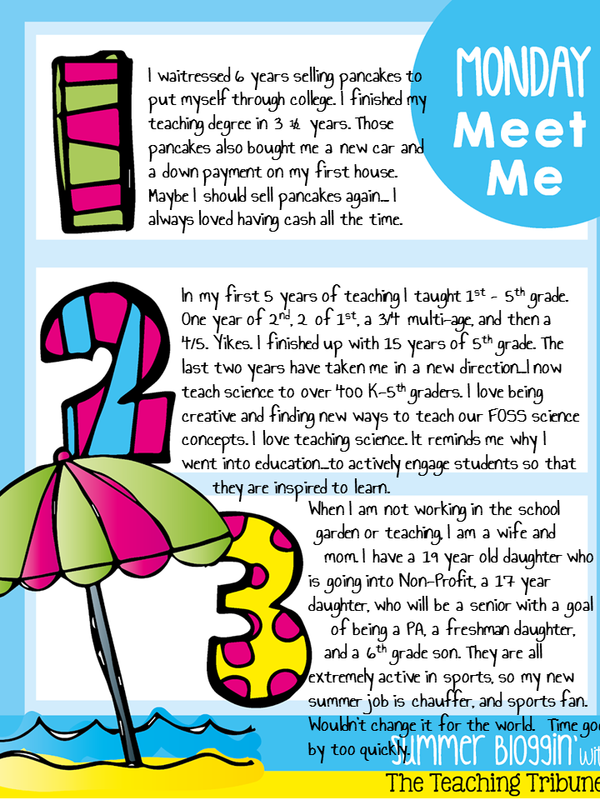 It is fun to get to know other blogger teachers out there! Can't wait to meet some of you as I read your posts. Thanks to The Teaching Tribune for this fun linky! Here is a little bit about me...background, school, family life! I have quite an extensive to do list. I want to make the most of every day. I am helping my oldest daughter paint and fix up some used and gently loved furniture. I was hoping that every Monday I could show you on Monday Made It, but time flies when the DIY list is so big. I am truly inspired by you amazing teachers out there that have me pushing myself...both making new products and working on things around the house. On my list this summer, is to build my knowledge of science and how I can add to our FOSS science kits. This weekend, I took a one credit class at the Energy Fair in Wisconsin. It was amazing! I walked away with a ton of information. From composting to sustainability, seed saving to solar energy in the classroom, it truly was a learning experience. I even won a prize! Look what I won! Over a $50 kit...I felt SO lucky! Can't wait to test it out with my son! Bought these cool solar bug kits from Brown Dog Gadgets. He gave me a zillion new ideas to try this next year! Learned about vermicomposting and how to make worm tea! This is how we can package our own castings! Our power company had an educator session on solar energy...this activity was fun. Can you get a sunburn when the sun isn't out? Can solar energy work through materials? Inspiring! Went to a ton of vendor sites. I got my neck measured for issues. See all the red? I had a migraine that day. I am a mess! Just a little about me here in Wisconsin! Glad you stopped by! Enjoy your summer and I hope you get some of your bucket list items checked off! I need an adventure with my family...any ideas on a budget? I'm excited to have found your blog through the linky party! I'm always looking for science ideas! Glad you stopped by. 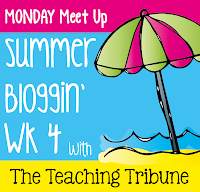 I am looking forward to the summer and getting back to bloggin'! Life is so busy, that it will be nice to focus on some new ideas for my science classroom! Welcome...Bethany!